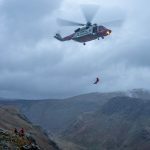 A 39 year old female was reported as being crag fast in strong winds, she was unprepared for the conditions and too scared to move near the summit of Atkinson Pike, Blencathra. The team sent a Landrover to Mousethwaite Comb from where, along with more members who had gone direct, they ascended the mountain. 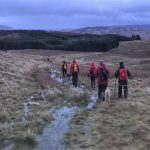 Two team members climbed up Scales Fell and the rest went to Scales Tarn and beyond to approach from the Mungrisedale Common side to maximise the chances of finding the casualty. The lady was found hunkered down by the summit cairn on Atkinson Pike. A group shelter offered immediate respite from the wind, rain and hail showers. She was given warm clothes then helped down the mountain back to her car.